A few (14, including variations) animated particle effects I did as a quick test. Laid out in a sheet format. Most have the camera rotate 45° on X axis, a few are top down. Niice! Thanks for sharing, para. Hey para, these look great. Would you mind uploading the project files used to make these? Have no idea what program you used but it's pretty neat to see these. This is awesome. +1 for telling us what program was used. I will almost surely use these in my Wesnoth campaign. The 45 degree top down fits great with Wesnoth perspective. the program used was Adobe After Effects, I did a little bit of scripting to make it so I can render out finished sheets in multiple angles and such.. or I can just plug in image sequences or clips and batch output them on a sheet layout. Manveru, hope they'll prove useful to you. If you need anything specific or there's something I can change just let me know. Great work mate. I did try messaging you about these, but no response. Thanks so much for the contribution though awesome stuff. very cool! 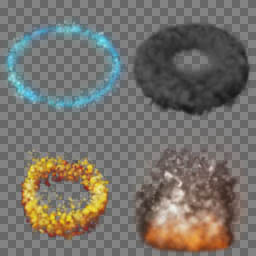 I think they can be used as 3D particles, do you think you could provide all the missing top down ones? without it I would have to stretch the image, what is not that hard but I think the original may look better? thanks!